Home Home & Garden Gardening Gardening / Prune roses any time you like! Gardening / Prune roses any time you like! Clematis… one of the most spectacular climbers. ROSES can be pruned at any time, it doesn’t have to be traditionally at the end of August/early September. Some readers, who have attended rose-pruning demonstrations, have been told timing is very important; prune too early and frosts will burn off leaves. Not so. Roses are dormant in winter with no leaves, unless it is very mild. I pruned ours at the end of March when they had finished flowering. This was after changing fixed ideas on pruning that I’ve followed for more than 40 years. This is in line with modern thinking confirmed by advice from one of the world’s greatest rosarians, Charles Quest-Ritson, the author of the Royal Horticultural Society’s “RHS Encyclopedia of Roses”. 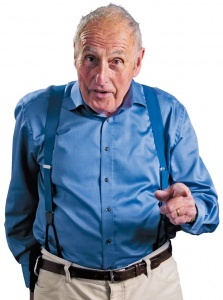 He says: “Pruning is no more than an option. For the really timid or novice gardener both ground cover [carpet] roses and modern shrub roses can be left completely unpruned or dead-headed without the slightest twinge of conscience. “A complete beginner can enjoy a wide spectrum of different roses without pruning. 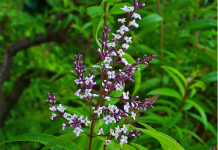 To win prizes at the flower shows then pruning produces larger flowers. 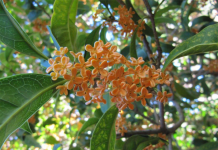 However, those flowers will be fewer and open later than an unpruned bush. The earliest blooms appear on roses that haven’t seen secateurs for several years. “Likewise, people grumble about mildew and black spot. These do no lasting damage and will not affect the flowers. We were not put on this earth to support the chemical industry. “The secret to growing good healthy roses is to feed the plants, they respond splendidly, especially if fed regularly”. Still, the easiest cure for mildew on all plants is one part full-cream milk to eight parts water. Spray under the leaves and around the root zone. Repeat as required, especially after rain. Potted roses can be planted at any time. WATTLES are now in full bloom and are getting the blame for all sorts of respiratory problems. 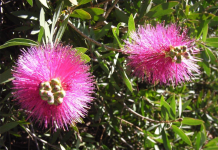 However, the pollen is too big and the culprit in nearly all cases is fine pollen on many conifers and grasses, a situation made worse by this year’s low rainfall and dry grasses in abundance. 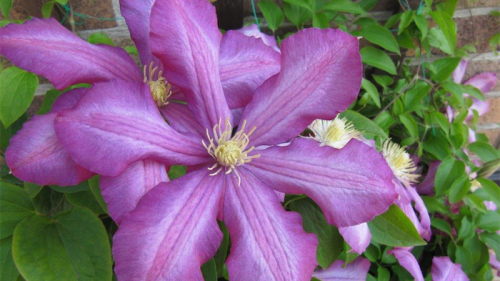 NOW’S a great time to plant clematis with most garden centres already having a wide selection. Dig as deeply as possible a patch at least 60cm across. Add compost worked well into the soil, but not animal manures. Add a dusting of garden lime. Plant clematis at least 4cm deeper than it is in the pot. One story I loved was about a family evacuated to the north of England from bomb-torn London during World War II. The rented cottage had a huge clematis almost covering the roof. Asking the gardener what was the secret, he replied in his rich North Country accent: “Furst you dig a big ‘ole, then you bury a dead ‘orse, it works every time”! 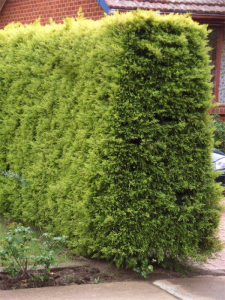 Complete cutting conifer hedges… shape the top narrower than the base to allow even sunlight on the whole hedge. Hold off tidying up frost-affected leaves on evergreen shrubs. Late frosts can cause real damage to newly emerging leaves. A few years ago we received a minus 6C on November 6, which cost the Pialligo orchards their flowers and fruit. Dig and divide bearded iris, lightly trim scraggly roots. Replant rhizomes facing north and south. Citrus can be planted now, however be prepared to cover if frost is forecast. I prefer to wait until mid-November before planting. Complete cutting conifer hedges, shaping the top narrower than the base to allow even sunlight on the whole hedge. Conifers will then not generally need to be trimmed again until March.